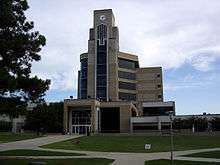 Arkansas State University (also known as A-State) is a public research university and is the flagship campus of the Arkansas State University System, the state's second largest college system and second largest university by enrollment. It is located atop 1,376 acres (5.6 km2) on Crowley's Ridge at Jonesboro, Arkansas, United States. The university marked its centennial year in 2009. 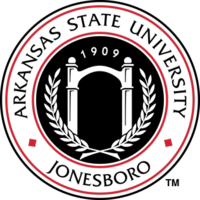 A-State was founded as the First District Agricultural School in Jonesboro in 1909 by the Arkansas Legislature as a regional agricultural training school. Robert W. Glover, a Missionary Baptist pastor who served in both houses of the Arkansas Legislature from Sheridan (1905–1912), introduced in 1909 the resolution calling for the establishment of four state agricultural colleges, including the future ASU. In 1918, ASU began offering a two-year college program. In 1925, it became First District Agricultural and Mechanical College. A four-year degree program was begun in 1930. A & M College became Arkansas State College in 1933. In 1967, the Arkansas Legislature elevated the college to university status and changed the name to Arkansas State University. In the fall of 2014, A-State welcomed its most academically prepared freshman class. The result of several years of growing both admission standards and increasing on-campus housing, A-State's incoming first-year first-time student composite ACT was 23.9 with an average high school GPA of 3.47. This was the third consecutive year of improvement for the ACT/GPA freshman classes for Arkansas State. The Arkansas State Honors College has grown 59% since 2009. The university also posted back-to-back high graduate counts in spring 2012 and spring 2013, producing the most graduates in a two-year period in school history. The university contains the largest library in the state of Arkansas, the Dean B. Ellis Library. For other Arkansas State University campuses, see Arkansas State University System. Master's degree graduate programs were initiated in 1955, and ASU began offering its first doctoral degree, in educational leadership, in the fall of 1992. A second doctoral program, in environmental science, was begun in the fall of 1997, and the doctoral program in heritage studies began in the fall of 2001. Newer doctoral programs are in environmental science, molecular biosciences and physical therapy. In the fall of 2016, Arkansas State will enroll the first class of approximately 115 students to its branch of the New York Institute of Technology's medical school. The medical school will be located on campus in the historic Wilson Hall. Today, the institution has more than 75,000 alumni. Programs at the specialist's, master's, bachelor's and associate degree levels are available through the various colleges: Agriculture and Technology, Business, Education, Engineering, Fine Arts, Humanities and Social Sciences, Media and Communication, Nursing and Health Professions, Sciences and Mathematics, and University College. ASU's Fowler Center is a regional center for The Arts. The ASU system includes campuses in Jonesboro (Craighead County), which offers degree programs through the doctoral level; Beebe (White County), Mountain Home (Baxter County), and Newport (Jackson County), where associate degree programs are offered; and at Heber Springs, Marked Tree, and Searcy. Arkansas State University-Beebe became part of the ASU System in 1955. It associated with White River Vo-Tech at Newport in 1992; that campus attained stand-alone status and is now Arkansas State University-Newport. The Mountain Home campus officially became ASU-Mountain Home on July 1, 1995. Delta Technical Institute at Marked Tree merged with ASU and became Arkansas State University Technical Center on July 1, 2001. A new campus was built for ASU-Heber Springs, which operates as a sister campus of ASU-Beebe. Foothills Technical Institute at Searcy was merged with ASU-Beebe on July 1, 2003, and is now ASU-Searcy, a technical institute of ASU-Beebe. ASU offers bachelor's degree programs, master's degree programs and upper level courses through ASU degree centers at ASU-Beebe, ASU-Mountain Home, and three other cities -- Blytheville, Forrest City, and West Memphis—where partnership agreements have been established in cooperation with the local community colleges. ASU also operates an instructional site at nearby Paragould in Greene County. A-State has grown rapidly over the past 20 years. Current enrollment for the Jonesboro campus stands close to 14,000, and the system has an enrollment of greater than 21,000. A-State's journalism program reorganized into the College of Media and Communication for fall 2013. The College of Media and Communication is home to three student-led media outlets and a NPR affiliate radio station. The Herald, a weekly student newspaper, was founded in 1921 and has a circulation of 5,000. ASU-TV, a program under the Department of Radio-Television, gives students hands-on experience in the field of television broadcasting. Starting in fall 2013, an Internet-based student radio station, Red Wolf Radio, was added to the student media. Arkansas State is also home to KASU, a 100,000-watt FM station, which is the oldest NPR affiliate west of the Mississippi River. Arkansas State participates as a member of the NCAA Division I Sun Belt Conference. The athletic teams, previously known as the Indians, are now known as the Red Wolves. In 2012, the Red Wolves football team became Sun Belt Conference champions for a second straight year, finishing the regular season with a 9-3 record, and capped off its successful season with its first bowl game victory since becoming a Division I-A (FBS) program with a 17-13 victory over Kent State in the GoDaddy.com Bowl, as well as earning its first win over a ranked opponent since joining the FBS in 1992. 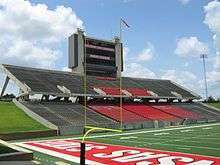 In 2013, the football team became the Sun Belt Conference champions for a third straight year, finishing with a 7-5 regular season record and won a second consecutive GoDaddy Bowl with a 23-20 victory over then 10-2 Ball State. Approximately 15% of ASU's students are members of one of the more than 25 Greek organizations located on the campus. Rick Crawford (politician) - United States Representative for the First District of Arkansas. 1 2 3 Arkansas State University Factbook for 2007-2008. ↑ "Arkansas State Welcomes Best-prepared Freshman Class". Arkansas State University. September 4, 2013. ↑ Arkansas State University Factbook Fall 2012-13. ↑ "ASU-Jonesboro: Act 100 Re-enactment Ceremony". astate.edu. Retrieved July 5, 2011. ↑ "Faculty Profile Dr Larry P Arnn". Hillsdale College. Retrieved June 5, 2013. 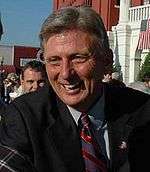 ↑ "Arkansas Governor Mike Beebe". National Governors Association. Archived from the original on June 23, 2013. Retrieved June 5, 2013. ↑ "Lonnie D. Bentley". Purdue University. Retrieved 14 June 2013. ↑ "Fred Barnett". pro-football-reference.com. Retrieved 14 June 2013. ↑ "Darren Benson". databaseFootball.com. Retrieved June 5, 2013. ↑ "Bill Bergey". databaseFootball.com. Retrieved June 5, 2013. ↑ "1980 NFL Draft". pro-football-reference.com. Sports Reference LLC. Retrieved November 18, 2014. ↑ "Ray Brown". NFL.com. Retrieved 14 June 2013. ↑ "Jason Tolbert, Ronald Caldwell Announces Candidacy For State Senate District 23 Race, July 2012". talkbusiness.net. Retrieved December 7, 2013. ↑ "Representative Davy Carter's Biography". votesmart.org. Retrieved September 10, 2013. ↑ "Maurice Carthon". Pro-football-reference.com. Retrieved 14 June 2013. ↑ "Ann Clemmer, R-23". arkansashouse.org. Retrieved January 8, 2014. ↑ "Rick Crawford". Biographical Directory of the United States Congress. Retrieved 14 June 2013. ↑ "John Dickson". basketball-reference.com. Retrieved 14 June 2013. ↑ "Carlos Antoine Emmons". NFL.com. Retrieved 14 June 2013. ↑ "Patrick Eddie". Basketball-reference.com. Retrieved 14 June 2013. ↑ "Jake Files' Biography". votesmart.org. Retrieved November 29, 2013. ↑ "Brad Franchione". Texas State University. Retrieved 14 June 2013. ↑ "Jeremy Gillam's Biography". votesmart.org. Retrieved December 27, 2013. ↑ "Michael John Gray". arkansashouse.org. Retrieved April 15, 2015. ↑ "Michelle Gray's Biography". Project Vote Smart. Retrieved April 12, 2015. ↑ "Leroy Harris". databaseFootball.com. Retrieved June 5, 2013. ↑ "Jeff Hartwig". Sun Belt Conference. Retrieved 14 June 2013. ↑ "Thomas Hill". Sports Reference LLC. Retrieved 14 June 2013. ↑ "Robert C. Hinson". The Official Web site of the United States Air Force. Retrieved 14 June 2013. ↑ "Verna Elisha Howard (1911-2000)". therestorationmovement.com. Retrieved July 12, 2013. ↑ "Blake Johnson's Biography". Project Vote Smart. Retrieved April 16, 2015. ↑ "David Johnson". NFL.com. Retrieved 14 June 2013. ↑ "Tyrell Johnson". NFL.com. Retrieved 14 June 2013. ↑ "Ken Jones". NFL.com. Retrieved 14 June 2013. ↑ "Cleo Lemon". NFL.com. Retrieved 14 June 2013. ↑ "D. Price Marshall". Federal Judicial Center. Retrieved 14 June 2013. ↑ "Ron Meeks". The Carolina Panthers. Retrieved 14 June 2013. ↑ "Dennis Meyer". Databasefootball.com. Retrieved 14 June 2013. ↑ "Josh Miller, R-66". arkansashouse.org. Retrieved December 29, 2013. ↑ "Jerry Muckensturm". Databasefootball.com. Retrieved 14 June 2013. ↑ "David Nail". Scripps Networks. LLC. Retrieved 14 June 2013. ↑ "Kyle Richardson". Databasefootball.com. Retrieved 14 June 2013. ↑ "Jerry Rook". Basketball-reference.com. Retrieved 14 June 2013. ↑ "Elbert Shelley". NFL.com. Retrieved 14 June 2013. ↑ "George K. Sisler". Arkansas State University. Retrieved 14 June 2013. ↑ Danielle Maddox Kinchen. "Ed Steimel, who left his mark on public policy in Louisiana, dies at age 94". The Baton Rouge Advocate. Retrieved April 10, 2016. ↑ Max Brantley (August 26, 2013). "News Release from Dan Sullivan". The Arkansas Times. Retrieved April 5, 2015. ↑ "Kellie Suttle". USA Track & Field, Inc. Retrieved 14 June 2013. ↑ "Charley Thornton". CBS Interactive. Retrieved 14 June 2013. ↑ "Corey Williams". NFL.com. Retrieved 14 June 2013. ↑ "Miller Williams". Poetry Foundation. Retrieved 14 June 2013. ↑ "Karen Hopper's Biography". votesmart.org. Retrieved January 7, 2014. Wikimedia Commons has media related to Arkansas State University.